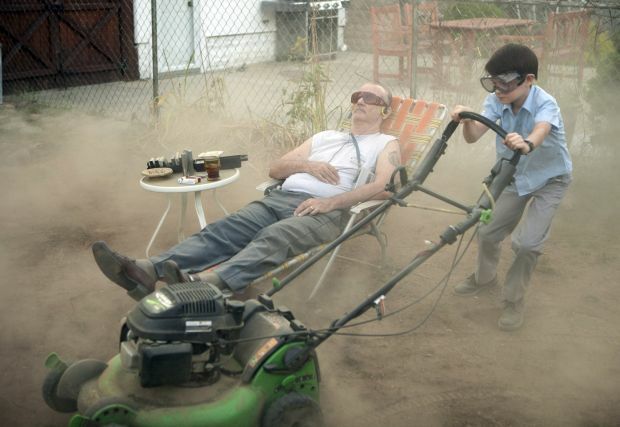 Bill Murray and Jaeden Lieberher star in a scene from the movie "St. Vincent." NEW YORK (CNS) — An unlikely baby sitter also serves as an unusual image of sanctity in the fundamentally endearing drama “St. Vincent” (Weinstein). While writer-director Ted Melfi’s feature debut has a broadly appealing message, aspects of its main character’s dodgy lifestyle narrow the scope of its appropriate audience. The film’s approach to moral questions, moreover, requires mature reflection. Bill Murray is pitch-perfect as Vincent, a hard-drinking, curmudgeonly loner shambling his way through life, cutting ethical corners at every opportunity. When Vincent acquires a new next-door neighbor in the person of recently divorced single mother Maggie (Melissa McCarthy), the two take an instant dislike to each other. But, with no one else available to mind her 12-year-old son Oliver (Jaeden Lieberher) after school, hardworking hospital lab technician Maggie is forced to turn to Vincent to do the job. Since Vincent is an inveterate gambler in serious debt to, among others, loan shark Zucko (Terrence Howard), he agrees to the arrangement. Vincent and Oliver bond over adventures at the race track, stints in Vincent’s favorite dive bar — where Oliver drinks soda, of course — as well as during visits to Vincent’s Alzheimer’s-afflicted wife Sandy (Donna Mitchell). Sandy lives in a luxurious nursing home whose costly rates clearly eat up most of Vincent’s scant income. Former boxer Vincent also teaches Oliver, whose small stature and lack of self-defense skills lead to his being bullied, how to stand up for himself. Increasingly, Oliver learns to look past his gruff caregiver’s obvious flaws and see the hidden goodness within him. Catholic viewers will especially appreciate the thoroughly positive portrayal of Oliver’s funny, patient and wise parochial school teacher, Brother Geraghty (Chris O’Dowd). The film’s title derives from a project Brother Geraghty assigns his students: to research someone in their lives who displays saintly qualities. The script makes a valid point by reminding us that even saints aren’t perfect during their lives here on earth. Yet its unabashed celebration of Vincent’s positive qualities — and the pass it gives to his self-destructive habits and small-scale misdeeds — have to be scrutinized within the context of the Gospel imperative commanding us to eliminate sin from our lives entirely. This is especially true of Vincent’s objectively adulterous relationship with Russian-born prostitute Daka (Naomi Watts). With Daka pregnant by an unknown father, her link with Vincent eventually evolves into a glumly chaste friendship, and he provides shelter both for her and the baby. But, while one can sympathize with the plight that led to their original connection, its sordid and exploitative nature can’t be overlooked. The film contains brief semi-graphic adultery, a benign view of petty theft, a prostitution theme, a couple of uses of profanity, at least one instance of the F-word and much crude language. The Catholic News Service classification is L — limited adult audience, films whose problematic content many adults would find troubling. The Motion Picture Association of America rating is PG-13 — parents strongly cautioned. Some material may be inappropriate for children under 13. Mulderig is on the staff of Catholic News Service.